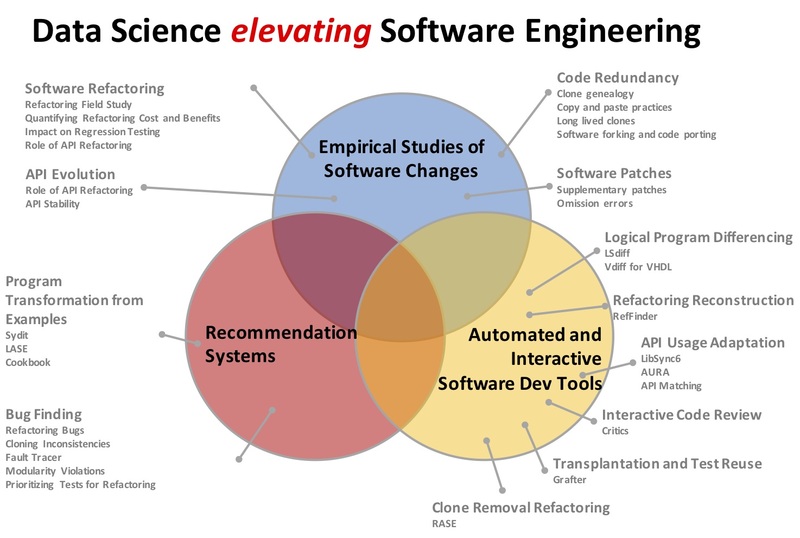 My research focuses on software engineering. I am a Director of Software Engineering and Analysis Laboratory at UCLA, developing program analysis algorithms and development tools. To improve programmer productivity and program correctness, we design, implement, and evaluate automated software analysis algorithms and tools. We also conduct user studies with professional software engineers and carry out statistical analysis of open source project data to allow data-driven decisions for designing novel software engineering tools. 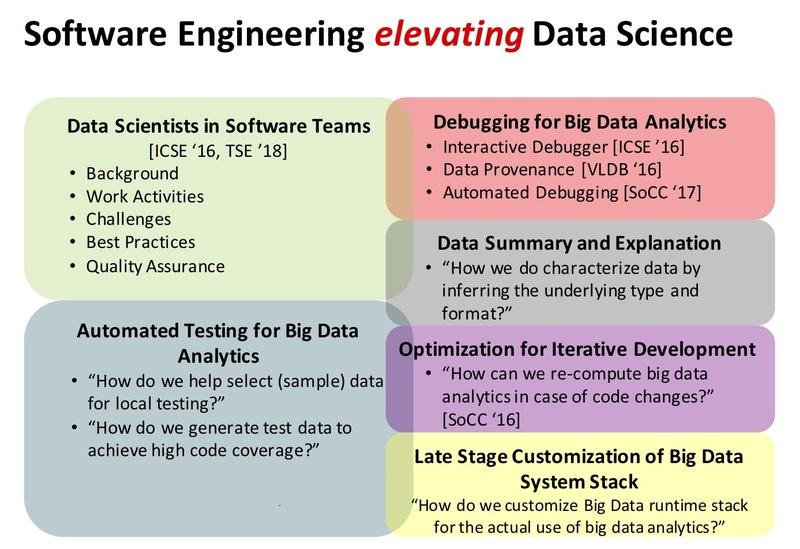 These days, my research focuses on software engineering support for big data systems and understanding how data scientists work in software development organizations. Research: I am an expert in software evolution, and I am known for my research on code clones--code duplication detection, management, and removal solutions. I have taken a leadership role in creating and defining the emerging area that intersects software engineering and data science. I have conducted the most comprehensive study of data scientists in industry and developed automated debugging and testing for big data systems. Several companies tech-transferred my research on interactive code clone search and big data analytics debugging technologies. Funding: I am leading a 4.9M Office of Naval Research project on synergistic software customization as a PI. My research is supported by grants from National Science Foundation, Air Force Research Laboratory, Office of Naval Research, Google, Microsoft, IBM, Intel, Okawa Foundation, and Samsung. Advising: My former PhD students are professors at Columbia University and Virginia Tech. Talks & Organization: I gave a Distinguished Lecture at UC Irvine, a Keynote Talk on mining, visualization, and assessing code on the Internet, and invited talks at Google, Amazon, Microsoft, Facebook, and Huawei. I am the organizer of a Dagstuhl Seminar on SE4ML--Software Engineering for AI-ML based Systems. I am a co-Program Chair of the IEEE 35th International Conference on Software Evolution and Maintenance. I am an Associate Editor of IEEE Transactions on Software Engineering. History: I ranked No. 1 among all engineering and science students in KAIST in 2001 and received the Korean Ministry of Education, Science, and Technology Award, the highest honor given to an undergraduate student in Korea in 2001. 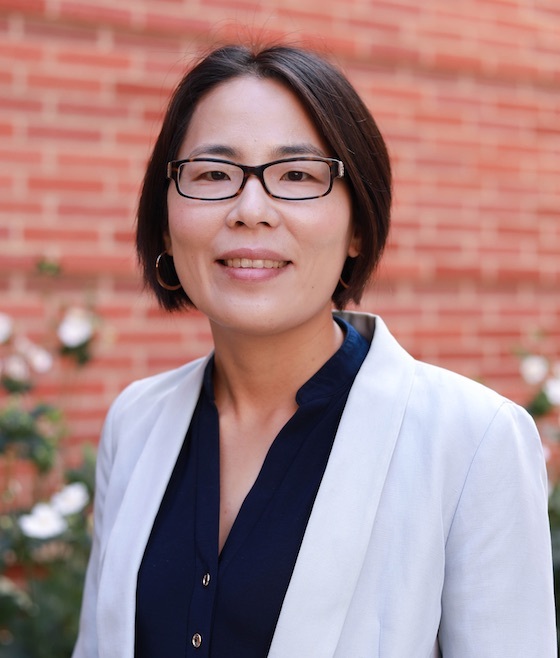 Miryung Kim is an associate professor in the Department of Computer Science at the University of California, Los Angeles. She received her B.S. in Computer Science from Korea Advanced Institute of Science and Technology in 2001 and her M.S. and Ph.D. in Computer Science and Engineering from the University of Washington under the supervision of Dr. David Notkin in 2003 and 2008 respectively. She received an NSF CAREER award in 2011, a Microsoft Software Engineering Innovation Foundation Award in 2011, an IBM Jazz Innovation Award in 2009, a Google Faculty Research Award in 2014, and an Okawa Foundation Research Grant Award in 2015. Between January 2009 and August 2014, she was an assistant professor in the Department of Electrical and Computer Engineering at the University of Texas at Austin and then she joined UCLA with an Associate Professor with Tenure. She also spent time as a visiting researcher at the Research in Software Engineering (RiSE) group at Microsoft Research during the summer of 2011 and 2014. As a side activity, I am passionate about improving diversity in computing and have created Mommy Computer Science Camp, which is designed to teach the basic concepts of Computer Science to 4 to 6 year old children using hands-on activities without using computers. Its story was featured in PC Magazine. Congratulations on Dr. Tianyi Zhang for a successful PhD defense. Our paper about common adaptation patterns of online code examples was accepted to ICSE 2019. Our paper about interactive code search via active learning was accepted to ICSE 2019. We released a command-line API misuse detector based on common API usage patterns mined from 380K Java projects in GitHub. The tool is now available on the ExampleCheck website. -Usability and Information Delivery" at the 1st Workshop on Automated Specification Inference. I gave a talk on "Data Science elevating Software Engineering and Software Engineering elevating Data Science" at the Huawei Vision Forum in Santa Clara. I am the Program Co-Chair of ICSME 2019--the 35th IEEE International Conference on Software Maintenance and Evolution. I am organizing Dagstuhl on "SE4ML - Software Engineering for AI-ML-based Systems" with Kersting, Van den Broeck, and Zimmermann. Our team received an NSF grant on Automated and Interactive Debugging for Big Data Analytics. I am leading this project as a PI with a co-PI, Tyson Condie. My student Muhammad Gulzar won a Gold Medal at ACM Student Research Competition at ICSE 2018. I received Doc Stevenson Award for Outstanding Faculty in Residence in 2018. I gave a Distinguished Lecture at the Institute for Software Research at UC Irvine. Here's a video link to my talk. Here is a link to my slides. Our paper on API usage mining in GitHub and a study of API misuse in Stack Overflow was accepted to ICSE 2018. Our paper on visualizing code examples at scale was accepted to CHI 2018. Our team received a 4.9 M grant from Office of Naval Research on Synergistic Software Customization: Framework, Algorithms, Tools. I am leading the project as a PI with co-PIs Jens Palsberg and Harry Xu. I and my PhD student Gulzar co-presented automated debugging of big data analytics at 2018 Spark Conference in San Francisco. We had a UCLA and UCIrvine ONR project kickoff meeting. We conducted the largest scale study of Data Scientists in Software Teams. This study is accepted to TSE. I presented our study of data scientists at 2018 Strata Conference in San Jose. My research and Mommy CS camp was featured on the PC Magazine and DailyBruin. Our work on big data analytics debugging was invited for a talk at the Facebook Software Engineering workshop in London. Our paper on automated debugging for Apache Spark is accepted to SoCC 2017. Our paper on refactoring error detection is accepted to TSE. Our team received a 1.7M grant from National Science Foundation and Intel on "A Multi-Paradigm Programming Infrastructure for Heterogeneous Architectures" (Cong and Kim at UCLA and Sampson and Zhang at Cornell). I received a Faculty in Residence Faculty-of-The-Year Award in 2017. My student Tianyi Zhang received Google Outstanding Graduate Student Research Award given by UCLA CS department. My student Muhammad Gulzar received Google PhD Fellowship. Our paper on automated clone transplantation and differential testing is accepted to ICSE 2017. I am a Program Board Member for ICSE 2017 and ICSE 2018. I am an Associate Editor of IEEE Transactions on Software Engineering (TSE is No 1. Journal in Software Engineering). Our paper on the interactive debugging primitives for Apache Spark is accepted to ICSE 2016. Our paper on the study of data scientists at Microsoft is accepted to ICSE 2016. I received an Okawa Foundation Research Grant Award in 2015. My PhD graduate, Baishakhi Ray (UT Austin PhD 2013), is joining University of Virginia, CS as an assistant professor. My PhD graduate, Na Meng (UT Austin PhD 2014, co-advised by Kathryn McKinley), is joining Virginia Tech, CS as an assistant professor. My postdoc, Myoungkyu Song (Virginia Tech PhD 2013), is joining University of Nebraska, Omaha as an assistant professor. Our collaborative NSF grant on interactive specifications is awarded. I am a General Chair for MSR 2016--the 13th International Conference on Mining Software Repositories. I am an Associate Editor of Journal of Empirical Software Engineering (No 2. Journal in Software Engineering). Our paper on refactoring of systematic changes is accepted to ICSE 2015. Our paper on interactive code review is accepted to ICSE 2015. Our Air Force Research Laboratory grant is awarded. I am creating a new graduate course on Data Science in Software Engineering. I am a Program Board Member of ICSE 2016. I accepted an Associate Professor position with tenure at UCLA. I received a Google Faculty Research Award. I am serving on the ICSE 2015 program committee. Our collaborative NSF CPS grant is awarded. I am serving on FSE 2014 and ICSE 2014 program committees. Our papers on example-based program transformation are accepted to ICSE 2013 and ICSE 2013 demo. Please check out the demonstration video of our example-based program transformation tool, LASE Eclipse plug-in. Our paper on cross-system porting is accepted to FSE 2012. Our paper on the field study of refactoring benefits and challenges is accepted to FSE 2012. Our paper on Repertoire is accepted to FSE 2012 formal demonstration track and the tool is available now. I am serving on OOPSLA/SPLASH 2012 program committee. Our paper on Vdiff is accepted to Journal of Automated Software Engineering. Our paper on change rule inference is accepted to TSE. I am is invited to a panel at the CRA Career Mentoring Workshop in DC. NSF REU grant is awarded. I am creating a new Software Engineering and Design Laboratory class, EE461L. Our collaborative NSF CCF SHF grant is awarded. I am visiting Microsoft Research, the RiSE (Research in Software Engineering) group. I received 2011 Microsoft Software Engineering Innovation Foundation Award. Our paper on edit script derivation is accepted to PLDI 2011. Our empirical study on refactoring and bug fixes is accepted to ICSE 2011. Our paper on modularity violation detection is accepted to ICSE 2011. A code clone study paper is accepted to FASE 2011. A Verilog program differencing algorithm has won ACM SIGSOFT Distinguished Paper Award at ASE 2011. Ref-Finder Eclipse plug-in is available now (See our FSE 2010 demo paper). I received 2009 IBM Jazz Innovation Award.